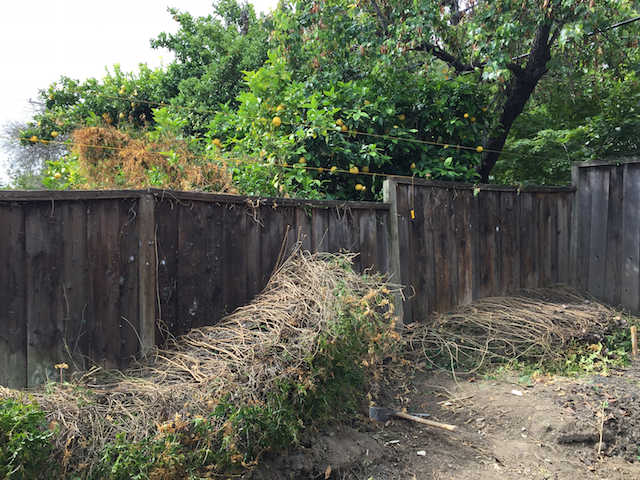 After living here for five years, the fences around our yard have started falling apart and with water restrictions becoming a very real thing here this summer, it was time for a change. Cue the Home Improvement Snowball Effect. 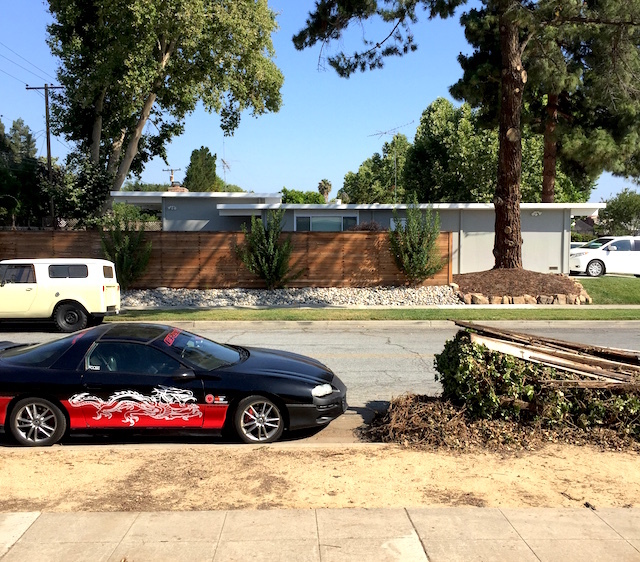 We are redoing all of the hard scape in the front and back, replacing our ivy-encrusted fence, and putting in plantings which will cut down on our watering needs. It’s a major project and definitely not DIY, at least for us. 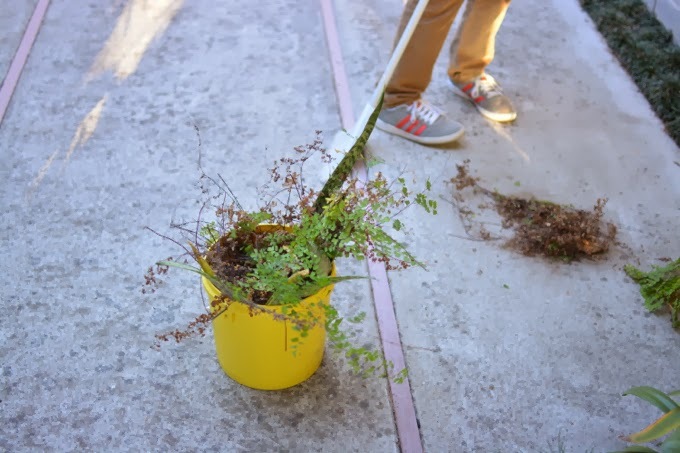 We decided to work with a professional landscape designer too, which we are really appreciating now that things are in full swing. I know it may not look like much from the photos yet, but I can already picture the end result and am really excited for it! We loved our big, green fence covered in ivy for the first few years of living here. Last year part of the ivy started to dry up and die, while the rest of it continued to thrive bust apart our fence. 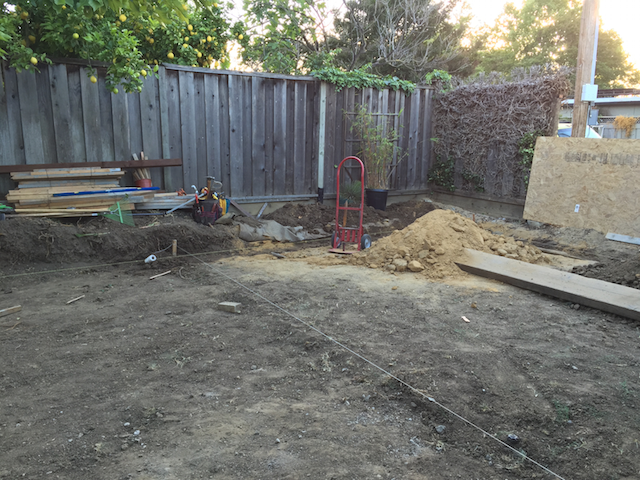 It was actually this fence which made us pull the trigger on this project. Here’s what the progress has been like, starting with the initial demo . 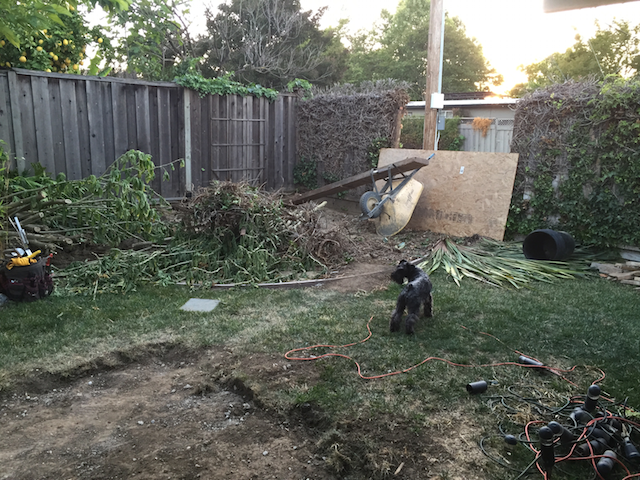 . .
Uncovering some rotten fencing . . .
That portion will be replaced, nudging it up a bit to remove the ‘step’ you see in the middle. 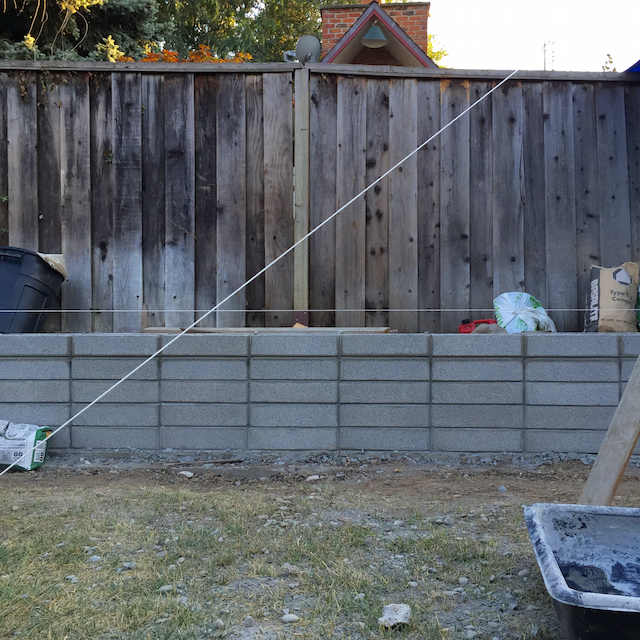 Our original plan called for board-formed concrete retaining walls, but we’ve switched it up with cinder block. 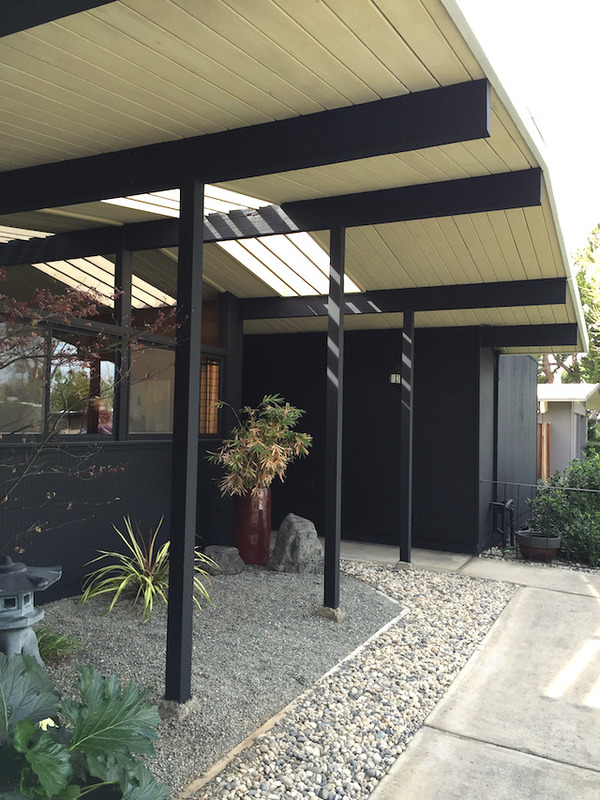 It turned out to be more cost effective and we feel it’s a better fit with the house. 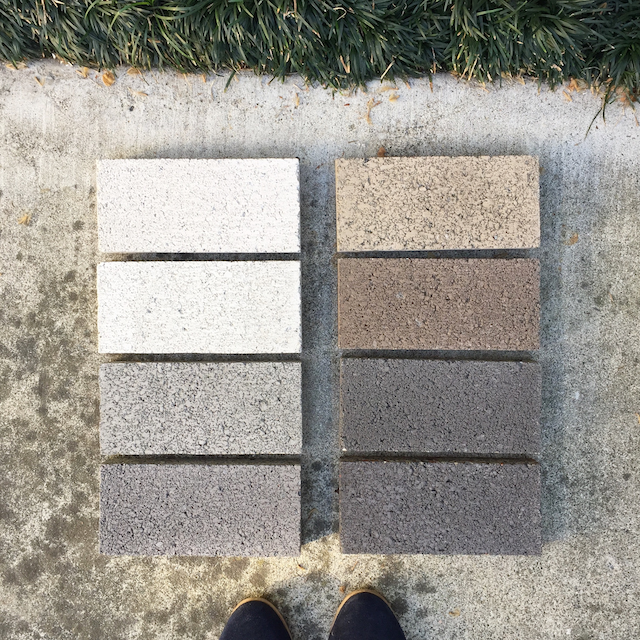 I got to pick the cinder block colour, which I never knew was a thing. 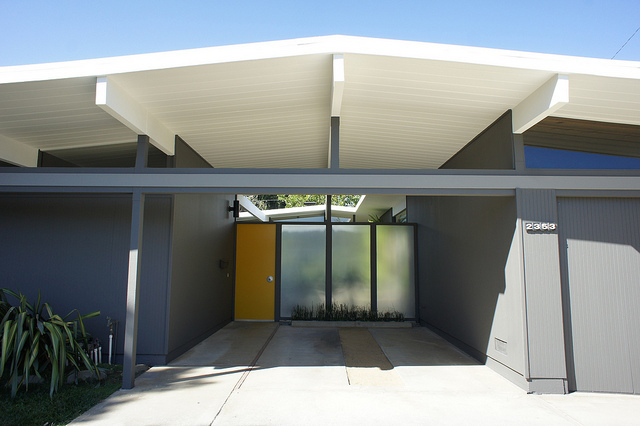 I loved the dark grey, but it matched our house a little too closely. 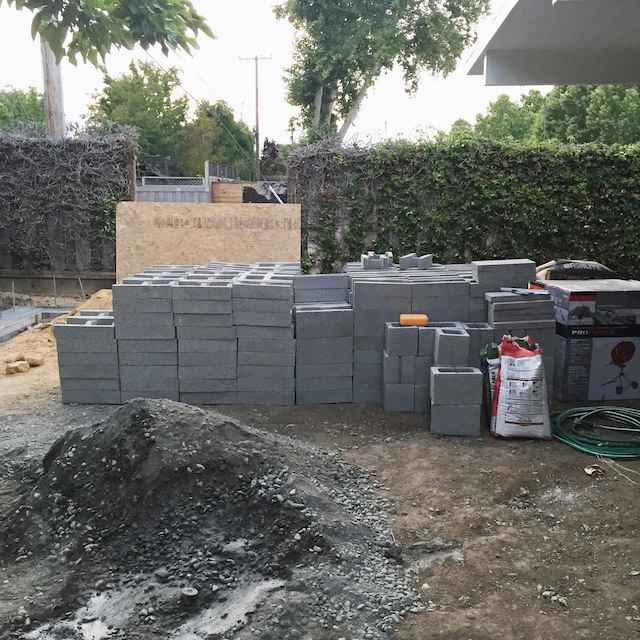 After the demo and making a few material selections, our construction crew got to mapping out the walls and pouring the footings for our retaining wall. 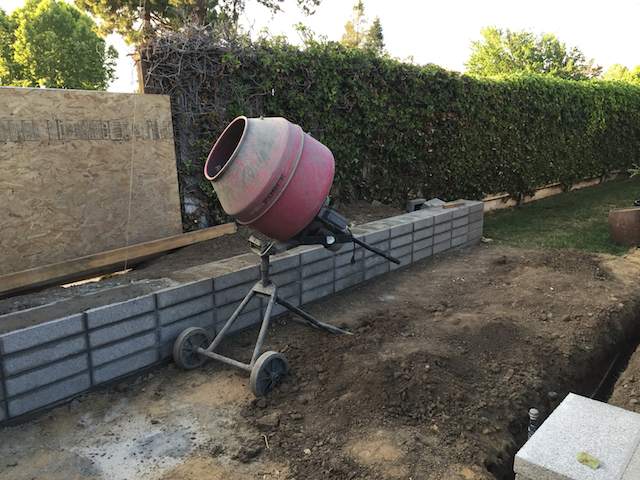 Then the cinder block wall started going up! 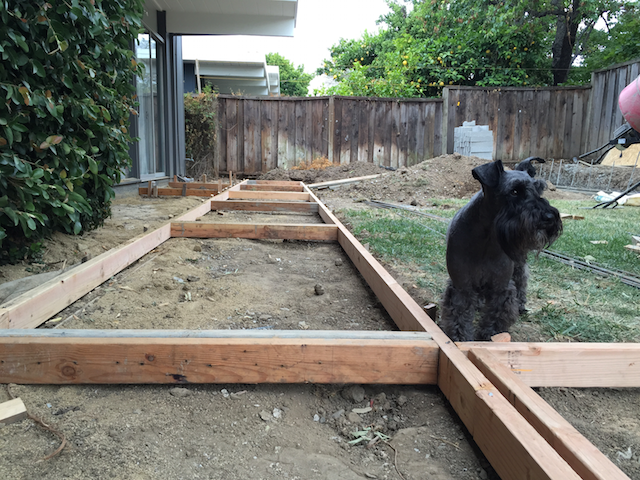 At the end of each work day, our dog Winston makes his rounds and inspects just about everything the crew worked on. He is trying hard to understand why we destroyed his yard so completely, and is rolling with it. Oh, sweet pup. 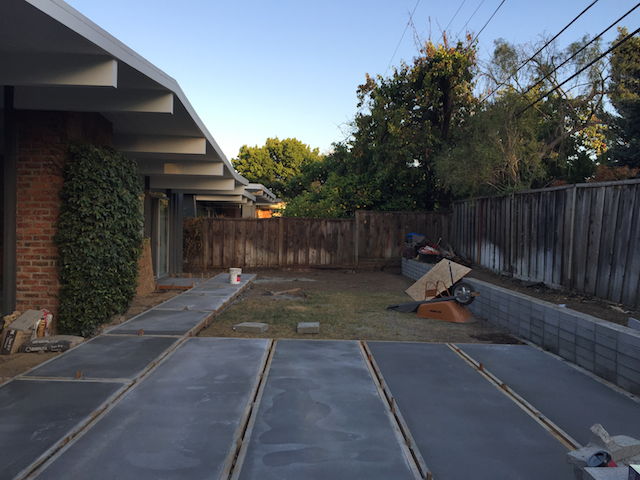 On the non-preservationist side, we did take out the original Eichler concrete patio to make way for new concrete pavers. It was a tough decision (for me) but we were feeling pretty cramped with the area those provided. Our new paving follows the footprint of the originals in the living/dining area, so I hope Joe Eichler is not frowning at us too much. 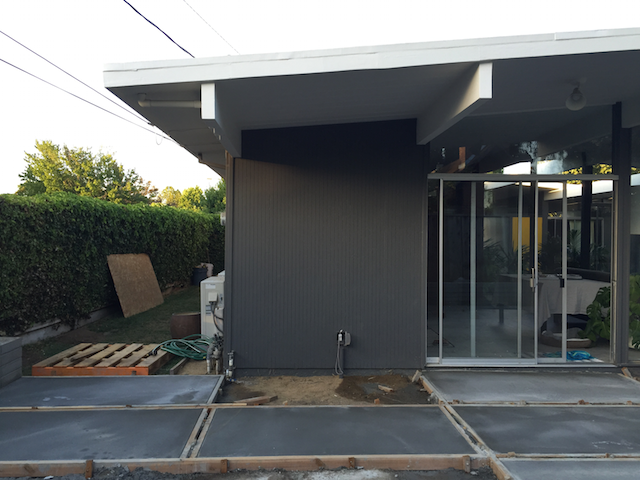 Some very beautiful concrete was poured this week . . . 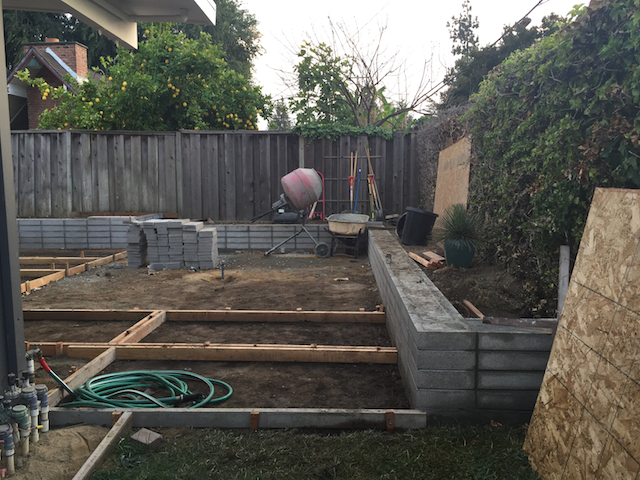 The retaining wall here will provide extra seating in our lounge area. 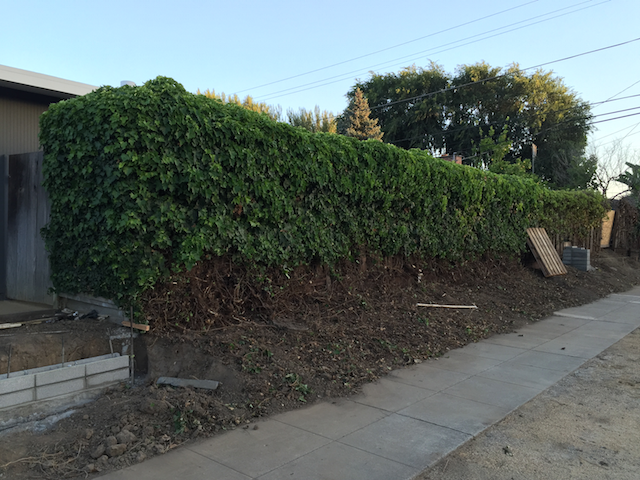 Soooooo excited for this one in particular . . .
. . . and as of Friday, the ivy fence is down! That’s the fence laying in a heap by the curb, and my now unobstructed view of the neighbours. The amazing Camaro, by the way, belongs to one of our landscape guys. I know, you wish you had a car with a dragon on it too. It’s been quite the process so far. That’s all I have to share for now– I have some plant choices to make next. And a few posts to catch you up on in the meantime. SO exciting! 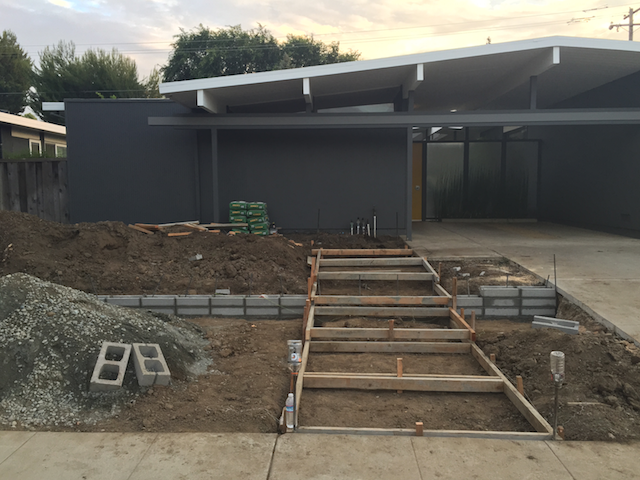 The front steps/structure look awesome. Loving the rear cinder-block too. 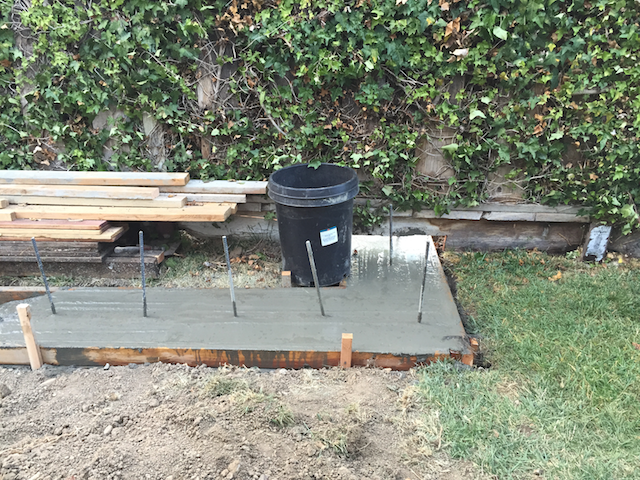 I think you’re right to re-pour the patio slabs –they will look original, or at least ‘right’ when it’s done. Aww sweet Winston –he’ll love it in the end. Look forward to watching your progress. Digging the dragon Camaro too! Thanks Andy! It’s going really quickly now. The fence is next! 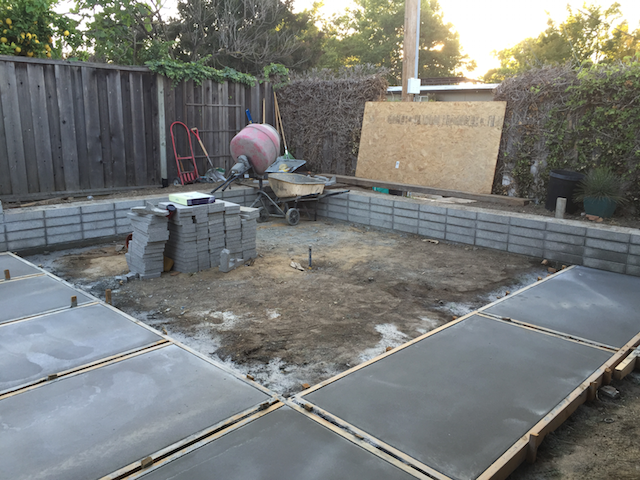 I took a moment this evening to relax on the seat wall and look everything over– the new patio slabs are looking like they fit right in. Winston did some racing around on the slabs too… so I’d say he’s warming up to the situation pretty well. I can picture exactly what it will look like when it’s done and you guys are doing a great job! I think it will really enhance the feel of your house. I have to do some similar landscaping, would it be OK to ask the approximate cost of the landscaping you’ve shown? I know it’ll differ from region to region but a ballpark is always useful (completely understand if you don’t want to list that kind of information). Thanks! Thanks so much, Brooke! 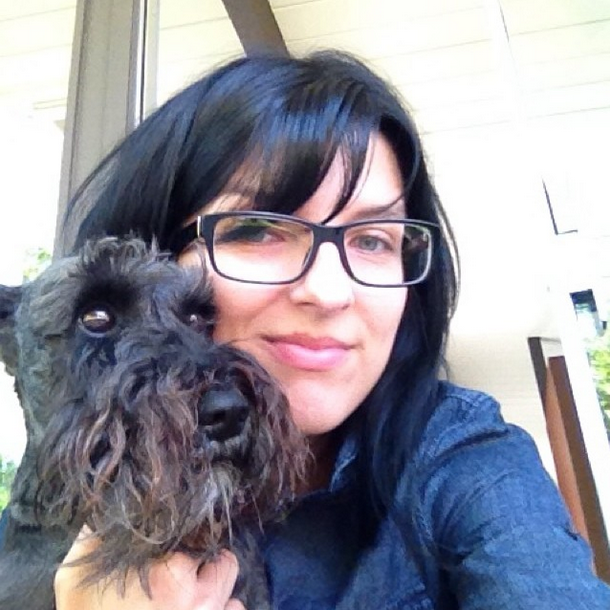 Feel free to drop me an email if you’d like to discuss: dearhouseiloveyou [at] gmail.com. Cheers! Cuddles for Winston- hang in there, buddy!